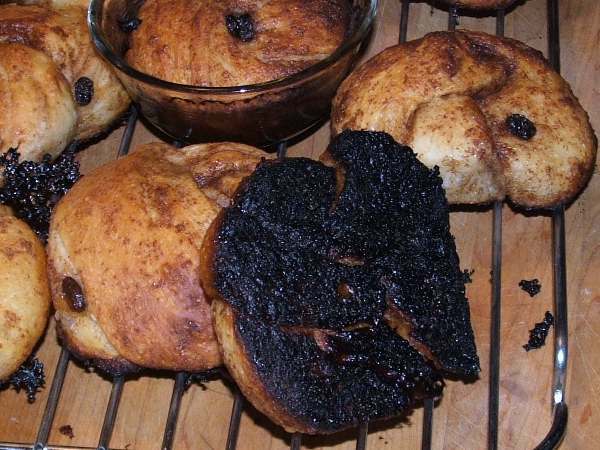 It looks like you baked them in glass ramekins. I don't know what the recipe calls for, but glass makes a difference in baking. I have always read to lower the oven temperature 25 degrees for glass. Why not put them into cake pans? I baked all but two of the buns on parchment covered jelly roll trays, Ramona. There wasn't room for two of the buns on the trays so I put them into pyrex custard bowls. And of course, you're right about pyrex baking at a different temperature. My plan (if I'd heard the bell) was to check the pyrex buns first. Also, next time, I will remember to put them on the uppermost shelf of the oven (as per my note to myself from the second to last time I made them). I was so thrilled and excited with myself for succeeding with the wild yeast that I foolishly baked this particular batch on the second to the top shelf. However, I suspect that if the bell had rung, there would have been no black to scrape off. I'm not sure which timer is better - the one that clips to my collar, so I'll hear it wherever I am, or the one that has a most annoying sound that continues for at least a minute if I don't get up and turn it off. I'd like to say that between the two of them, I never burn anything, but I'd be lying! The cinnamon bun recipe looks very interesting, as do the Lucia Cats. It's probably a good thing for my waistline that I don't have time to bake as much as I would like to. At any rate, I've bookmarked both of them. Both the cinnamon buns and the Lucia Cats are fabulous, KipperCat. Lucia Cats might be fractionally better for your waistline because they don't use quite as much butter. Do let me know if you make either or both of them. I'd love to hear what you think.